Mix all ingredients of the marinade in a bowl and whisk until well blended. Trim all vegetables and slice lengthwise in ¼-inch thick slices. In a large, shallow glass or ceramic baking dish, arrange the sliced vegetables. Add the marinade, turning the vegetables to coat with the marinade and let stand, covered and chilled for at least 4 hours or overnight. Stir the vegetables occasionally to ensure they stay coated with the marinade. Before cooking, drain the vegetables, reserving the marinade. Heat a grill pan over moderately high heat until hot. Add vegetables and grill, in batches, for 3-4 minutes on each side, or until tender. Transfer vegetables to a serving platter, drizzle with remaining marinade and sprinkle with parsley, olives and Parmesan shavings. The vegetables here are a staple in most Italian households. Grilling them over a high heat, with the marinade very reminiscent of a fine Italian dressing. For added flavors, try brushing the marinade over the vegetables as they are grilled. Use a small bunch of parsley as the brush. As kids, we used to call this marinade “zum-zum” sauce. It is also great on grilled chicken. Try it that way too. This dish tastes as good as it looked. I went to the Hollywood Farmer's Market in Portland, OR to get what's in season--baby squash, spring onions--and added in eggplant and peppers. I marinated the veggies overnight and then grilled them on the stove with a grill pan. Just make sure to have a good fan on or open the windows because it gets smokey. The vegetables were a fantastic side dish for burgers. Couldn't agree more with Barb's review. The smoky flavor and grilled texture is hard to beat. The squash was my favorite part, but the rest was divine as well. These veggies pack a delicious drool-inducing flavor punch. I heart Verdure Cotto ai Ferri. Italy is nice too. This is from DJPLAM. 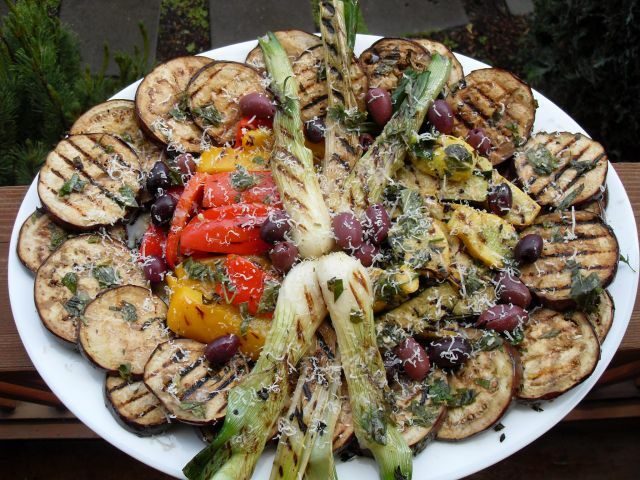 I want to thank all of you for the great reviews of my recipe for Verdure Cotto ai Ferri, Grilled Vegetable. I am glad you liked the recipe and estatic that you took your time to review it and post it. Thanks again. Good taste & So delicious and yummy -Amazing recipe. i found the same recipe from another site like sooperchef.pk . These cookies are awesome i will suggest you to must visit (https://www.sooperchef.pk/pakistani-recipes/) to find recipes.